You’ve heard of “blue light” right? That light that keeps you up at night? But do you actually know what it is and its effect on your mind? It is a question that I get asked often, so allow me to shed some light on the topic (no pun intended)! In order for us to get out and about to live our lives, Mother Nature had to find a mechanism to boost our alertness, elevate our mood, increase our reaction times and increase our feeling of wellbeing, so she gave us the blue light from the sun. Now then, what is blue light? The light that travels from the sun comes in waves and 7 different colours (the visible part of the spectrum): violet, indigo, blue, green, yellow, orange and red. We see these colours, or any combination thereof, every time we look at an object. Every object, when exposed to light, either absorbs or reflects that light. Ever wonder why tomatoes are red and bananas are yellow? Each of these fruits have properties that absorb and reflect light to varying degrees, resulting in our experience of a multi-coloured universe. You can also see these colours when you look at a rainbow, since the water drops act like a prism to separate light into its different wavelengths. Speaking of wavelengths, every colour radiated by the sun has a specific wavelength which varies in range, length and energy emission. Blue light has one of the shortest, higher-energy wavelengths, which explains why our minds are so susceptible to this part of the light spectrum. Our bodies are designed to use this energy-rich, blue light from the sun to stimulate our brains and regulate our circadian rhythms (our natural sleep and wake cycles). 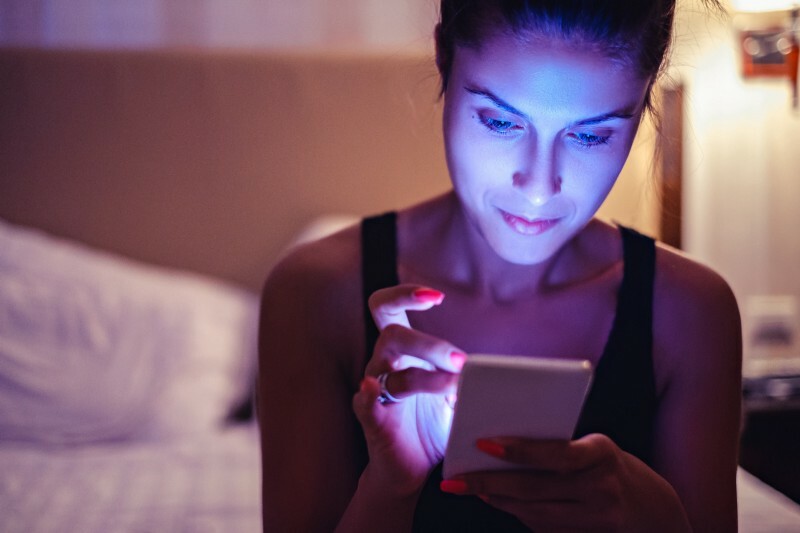 Extended exposure to blue light however, can be seriously detrimental to our health. According to Harvard researchers, the harmful effects of prolonged exposure include disruption of our sleep-wake cycle, eyestrain syndromes, greater risk of diabetes, heart disease, obesity, depression and even certain types of cancer (breast and prostate primarily). One of the reasons why Mother Nature created the night-day cycle, was to shield us from continued exposure to blue light. For hundreds of thousands of years, our biology has been operating in harmony with the rhythms of nature. Every time the sun sets, our bodies secret melatonin, a hormone which among other things, induces natural sleep. Ever since the introduction of artificial light in the late 1800’s, that cue provided by the sun has virtually gone. To make matters worse, the introduction of digital light sources (rich in blue light), has compounded the problem. The really concerning fact is that light emanating from our digital devices has a much higher concentration of blue light than natural light because it is “short-wavelength-enriched”. The main artificial sources of this blue light include fluorescent and LED lighting, electronic devices, TVs, laptops, tablets, smartphones, and fluorescent lighting. As you can imagine, bathing our eyes in blue light during the course of the evening as we work on our computers, watch television or engage in social media, extends our exposure to these enriched high-energy waves. Blue light reaching our retina is interpreted by our minds as ‘it’s time for action’! Melatonin secretion comes to a halt and both adrenaline and cortisol (the stress hormones) begin permeating our bloodstream to enable our mind-body system to remain active and in high-alert mode. Remember, all this happens at a time in the evening in which we should be actually giving our mind-body system the restoration it needs to optimise our performance the following day. Had Elton John known this, he would have not had to guess “why they call it the blues”! Read a Print Book.-Backlight screens in tablets and some e-readers are essentially throwing light directly out into your eyes, so opt for a print book for your night-time reading. If you already own a digital version of your favourite book, buy a cheap used hard copy version to read in the evening. Go Screen Free.- Try going screen free 2 hours before bedtime- it’s a game changer. Avoiding exposure to digital devices will help provide the right environmental cues to your body to start winding down and facilitate the process of obtaining restful sleep. Play a musical instrument.-If you have been wanting to learn how to play a musical instrument, this is your chance! Most music teachers will tell you that practicing little and often is a sure-fire way to master an instrument, so why not spend 30 to 45 minutes in the evening fulfilling that long-held desire. Consider blue-blocking technology.-If your technology dependence is off the charts or if you work a night shift, consider apps that filter the blue wavelength or wear blue-blocking glasses. Use dim red lights for night lights. Red light has the least power to shift circadian rhythm making it the preferred type of evening lighting since it does not suppress melatonin secretion. You might trigger memories of a past visit to that cabaret a while back, but your mind-body system will thank you for it! Originally published at cesargamio.com on May 14, 2018.